As one of the UK’s most trusted brands, the M&S CEO challenged the leadership to come up with a plan for reinventing retailing for the 21st Century in order to underpin that trust by building a sustainable business. Out of this realisation ‘Plan A. 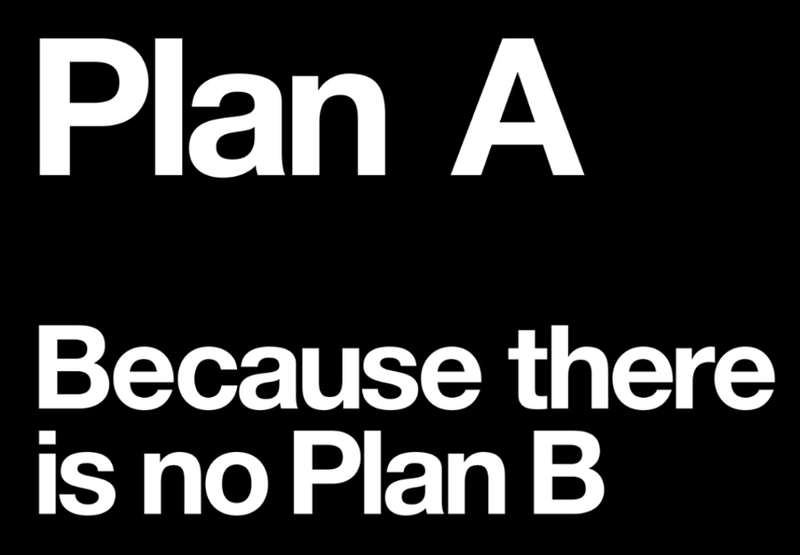 Because there is no Plan B’ was born. M&S made 100 commitments to reduce the social and environmental footprint of their business across all that the company did, inclusive of hundreds of stores and thousands of supply chain locations. ‘Plan A. Because there is no Plan B’ sought to emphasise that this was a clearly defined plan with set targets, as well as invoking the need for urgency in tackling the issues. Pre-Fortitude, Robert Nuttall devised the Plan A ‘brand’ and all associated communications assets that were used to engage 83,000 colleagues (including 600 Plan A ambassadors), opinion formers, suppliers and customers. This included an employee engagement toolkit, external websites including suppliers, in-store collateral to engage customers, and even the teardrop-shaped trailers designed to reduce CO2 emissions. In addition, he created leadership speeches that emphasised how Plan A connected with the company’s purpose and core business strategy. One of the businesses that arose from Plan A was M&S Energy. M&S Energy promises that, for every unit of electricity used, it puts one unit of hydro-generated electricity back into the grid. Fortitude worked with the leadership of both M&S Energy and SSE (who supply the energy) to devise a strategy that would more powerfully connect with customers and emphasise the benefits of the partnership. From this work, M&S Energy launched a groundbreaking Community Energy Fund from which it awards funding to local community energy projects looking to install renewable technology or energy efficiency measures. M&S Energy is now the seventh largest energy provider in the UK. Following on from this work, Fortitude supported M&S in working through a repositioning of Plan A which included determining the criteria and territories for major consumer-facing campaigns. One of the most significant of these was the clothes exchange campaign ‘Shwopping’ which built on an existing relationship with Oxfam established as part of Plan A. To date, over 7.7 million items of clothing have been prevented from ending up in landfill, and Plan A has generated over £5 million for the charity since it was launched. In addition to the positive societal and environmental effects of Plan A, it has also delivered more than £750m in net benefits since it was launched in 2007.